When the BabyHawk Mei Tai (Asian Baby Carrier) arrived a few weeks ago, my 3-year-old was so interested in what it was. He tried to move the straps around, configuring a way to carry his “baby kitty” (stuffed animal that he’s nearly convinced will become real when our baby is born.) Finally, seeing no easy way to strap the carrier onto him, I decided to have a little fun. 8 months pregnant, I carried the baby in my belly on front, and my preschooler on my back. And I have to tell you, it was such a simple carry. AT 34 pounds, he felt lighter strapped onto my back than he had in over a year being carried with my arms up front. What a thrill… and why hadn’t I been using a BabyHawk before? Knowing how useful it can be with a three-year-old, I can’t wait to carry my baby in a front carry. BabyHawks have a padded headrest so that even the youngest of babies can cuddle closely and safely in front. 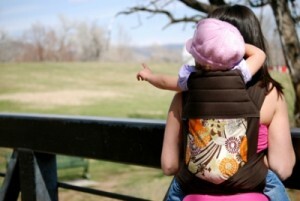 When my 3-year-old was an infant I was terrified of a Mei Tai (Asian Baby Carrier). All the super long straps were intimidating, and, of course, the biggest concern, how could I guarantee baby wouldn’t fall out? I learned that Mei Tai’s are like origami; bend, fold and twist, and they work. Follow the detailed instructions on BabyHawk’s site and you’ll be as surprised as I was at how easy they are. When searching for an Asian Baby Carrier, definitely look for padding, and lots of it. You’ll want the shoulder straps (which go around your shoulders) to be padded, as well as the leg straps for comfort of your child. And a padded headrest is such a necessary bonus to allow for ultimate comfort and support for baby. BabyHawk has all of this.